Such need is common when then need interfacing for IoT with household gadgets. Here is How to Invert Signal for Arduino (HIGH to LOW or the Reverse). One way is using some kind of relay module, which we described in our guide to interface with doorbell. This is normally a problem with devices that are active LOW. Since most devices are active HIGH, meaning they are triggered by a HIGH voltage, having a device that outputs a LOW voltage when triggered off is problematic. The solution is to use an inverter to switch the logic states of the active LOW device. In short, the inverter circuits outputs a voltage which is of opposite logic to input. Inverters can be a single NMOS transistor, a single PMOS transistor coupled with a resistor. This has disadvantaged for power consumption and also the processing speed. Inverters can also be constructed using two complementary transistors in a CMOS configuration. This configuration reduces power consumption and processing speed is improved. Other ways of inverter construction is with bipolar junction transistors (BJT). The original CMOS chips Ranged in voltage from 15V and in some cases up to 30V. Current CMOS chips will run at 15V or 5V. Few of these will run fine at 3.3 V. A level shifter is always recommended. 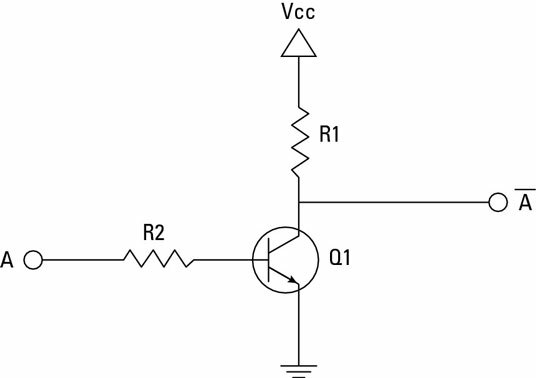 A Transistor-Transistor Logic (TTL) NOT gate aka inverter is one of the simplest logic gates and simple to build. Such circuits use some commonly available bipolar junction transistor (bjt) like BC549C NPN transistor, BC547, BC548, and BC549. In real life NOT gate using NAND gate is used. 7400 series IC used. This Article Has Been Shared 6945 Times! Cite this article as: Abhishek Ghosh, "How to Invert Signal for Arduino (HIGH to LOW or the Reverse)," in The Customize Windows, March 21, 2019, April 18, 2019, https://thecustomizewindows.com/2019/03/how-to-invert-signal-for-arduino-high-to-low-or-the-reverse/.